Today, we are all obsessed with looking young, and that means we focus a lot of our energy on our skincare. We’ve tried it all and women are starting anti-aging treatments as young as 19 years old to get a jump on the aging process. Our age shows due to environmental elements, stress, and natural expressionism throughout our lives, and most of us are willing to spend whatever it takes to turn back the clock. Microdermabrasion has been a popular spa and salon skincare treatment for years, but more and more people are just no discovering the benefits. Now you don’t have to pay the spa price. 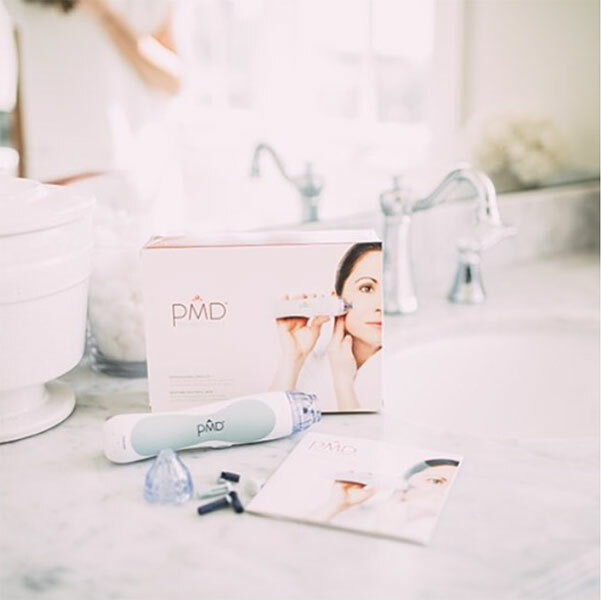 Now there’s PMD, personal microdermabrasion, a skincare device and product line you can use in the comfort of your own home. Our MyTopFace experts have tried the Personal Microderm Plus and Daily Regeneration System Start Kit, and we were pleasantly surprised with the at-home results. We love going to the spa and indulging in luxurious treatments, but in this day and age, we don’t always have the time. We’re all going to school, chasing kids around and/or building our empires, so personal microdermabrasion that we can use at our own convenience is perfect for today’s woman on the go. Personal microdermabrasion is perfect for all skin types. Most women who frequently struggle with acne blemishes tend to shy away from treatments like microdermabrasion because they think of their skin as sensitive and if they use any excessive exfoliation, they will breakout even more. They’ve got it all wrong. Yes, when using the PMD device you will want to bypass present blemishes and broken skin, but using this tool actually clears pores of bacteria, oil and dead skin cells that are the main culprits for all those unsightly bumps. So yes, don’t use on your current blemishes, but once they’ve cleared, you’re free to use the system and witness the magic of the PMD device. You will feel a vacuum-like suction and a gentle sandpaper tip. Microdermabrasion intensely exfoliates the top layer of skin, exposing new skin that will allow your skincare products to absorb into your skin better and treat your daily concerns more effectively. Using the PMD Microderm Plus device will give you the ease you need into microdermabrasion, as a first time user. It comes with a training disc for a more sensitive treatment, still exfoliates and clears skin like a dream, but later you can move into the more intense treatment with the PMD Microderm Pro device. The Pro comes with rougher discs that exfoliate skin more intensely, cleaning our pores and buffing away fine lines with noticeable results in just one treatment. For best results, you should repeat use every 6 to 7 days and use accompanying products to soothe skin and recover from your treatment. 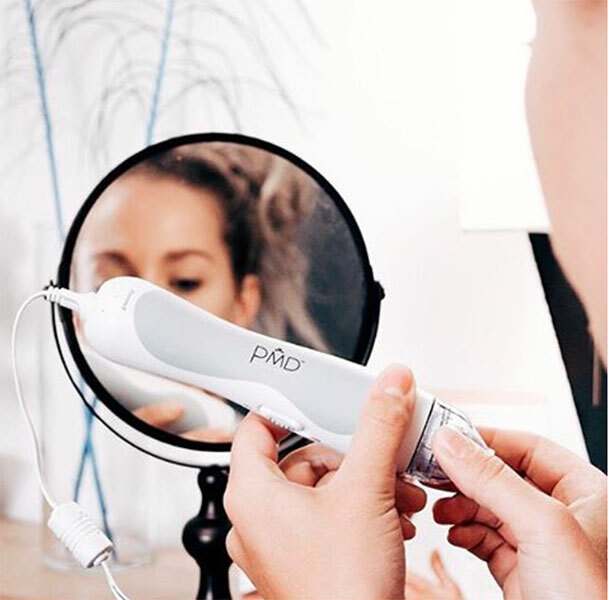 Using the Pro, your pores will appear small, skin softer, and lines less visible over time. Microdermabrasion yields the same results as a botox med spa treatment, without the invasive procedure. Your skin will feel lifted, firm and ageless. Now, that we have settled your fear of using the device, we can move into the instructions. The device is relatively small and fits comfortably in your hand. No batteries are needed because it plugs into your nearest outlet, so you’ll never lose your charge. The PMD device comes with several microderm discs that are different in texture. It is recommended to start with the training disc so that your skin can become familiar with the device and then after a few treatments you can move on to discs that are rougher to the touch. First, you’ll want to cleanse your face with the PMD Advanced Soothing Cleanser to make sure your skin is clean and calm before use of the device. Once your skin is clean, smooth the tool over your skin in upward motions, never passing over the same area twice, and always avoid any broken skin. Microdermabrasion will allow a new level of skin exfoliation, sloughing off all dead skin cells and creating a fresh, new surface, while diminishing fine lines and wrinkles. Your skin will feel softer, and results can be seen immediately. Use PMD on your facial skin and your entire body as desired. After using the microderm device, use the PMD Neutralizing Toner to smooth away any flaking skin left behind by your treatment. It will reduce blemishes and even the tone and texture of your new skin. The toner is recommended for daily use. Apply on the skin using a cotton pad, morning and evening. It will refresh your skin and reduce any excess oil or shine. Newly PMD exfoliated skin requires gentle, loving care to repair and look its best. 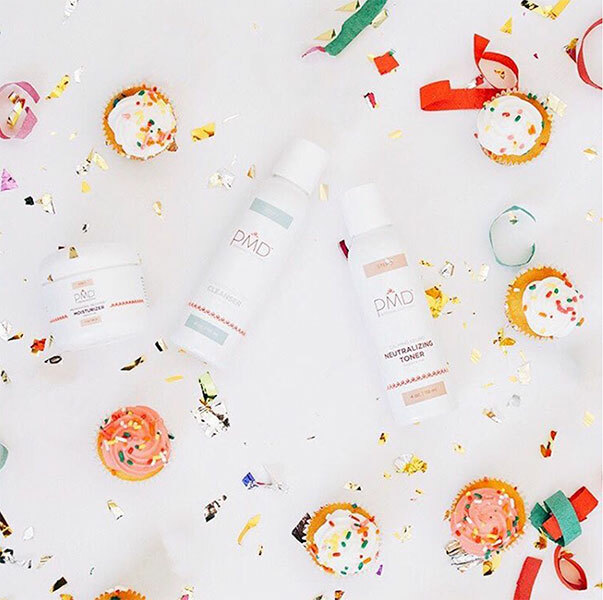 After using the toner, you can smooth on the PMD Professional Recovery Moisturizer, or move straight to the recovery mask. The PMD Recovery Collagen Infusing Facial Mask is our favorite part of the PMD product line. Not only does this mask help your skin repair after microdermabrasion, but it can also be used alone for general anti-aging skincare as well. It’s a sheet mask with two protective sheets in the back and front of the mask. To apply, remove the sheet mask from its packet, remove both the back and front protective sheets and apply the thin, white layer over your face. 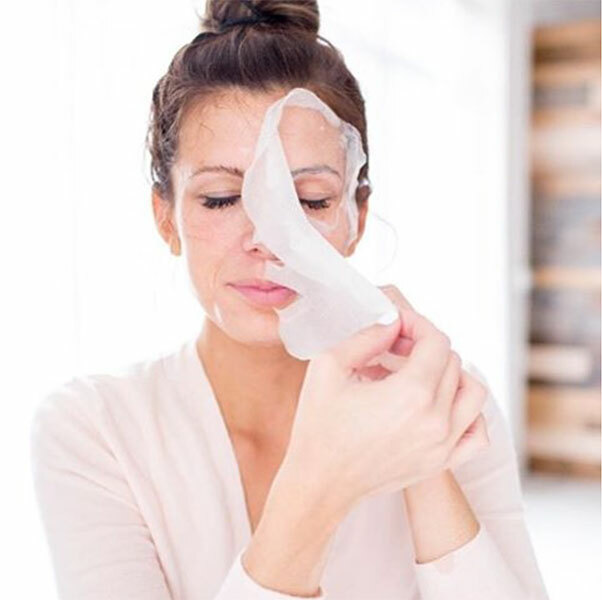 The sheet is soaked with skin-loving ingredients for intense hydration, soothing and minimizing the appearance of fine lines, wrinkles, and dark spots. Leave on for 15-20 minutes, then peel off and rub in any remaining products into the skin. After just one use our experts saw immediate results, with a noticeable difference in the appearance of fine lines on the forehead. The collagen mask leaves skin feeling moisturized and feels like a cold cream when on, allowing your skin to feel refreshed. Once the mask is removed, your skin will feel softer, look younger and after a few minutes you should notice a firming and tightening feel. That means it’s working. Use the recovery mask after a device treatment, or use it by itself for daily anti-aging care. PMD skincare is your personal way to microdermabrasion at home. Use the Microderm device with the PMD recovery products and your skin will appear brighter, fresher and clearer over time. Using the device, it is recommended to wait between 6 and 7 days before treating the skin again. The complimenting products can be used daily. The cleanser is moisturizing and soothes the skin, calming redness and creating a soft surface, the toner refreshes skin and clarifies pores, while the moisturizer leaves skin feeling supple. The Recovery Collagen Infusing Facial Mask is our favorite and a standout for immediate anti-aging properties. Enjoy using the PMD collection; look and feel younger with every treatment.